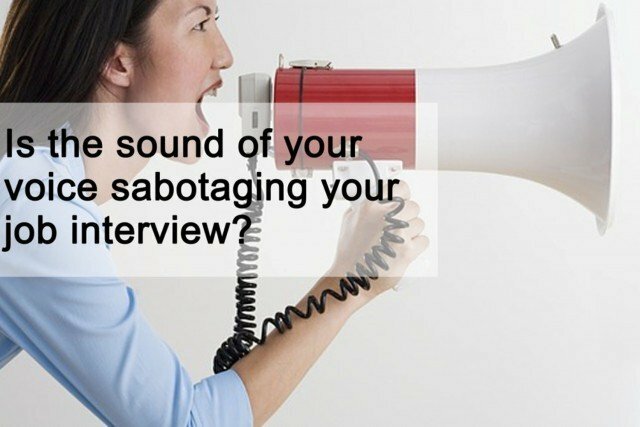 Is the sound of your voice sabotaging your job interview? It’s not WHAT you say so much as HOW you say it. According to one leading theory, 55% of human communication is with body language. You are left with just 7% on content and a whopping 38% on what you sound like. After 48 hours, 90% of a conversation is forgotten – what is remembered is the impression made. Your voice and speech habits will influence a person’s perception of you. But do you know how to create that all-important lasting impression? We asked voice coach, Matthew Clarke, for his top tips on how you can prepare your voice for a senior executive level job interview. Matthew has spent the greater part of his working life using his voice professionally and regularly provides voice coaching for Executive Connexions’ clients during the interview preparation stage. He shares a number of important points that arise in preparing yourself to speak with confidence and authority. There is nothing better to do if you want to sound confident about your subject than to actually know your subject well. In addition to studying your prospective employer, you’ll want to brush up on common interview questions. A review of your CV should help you identify questions you’re likely to be asked (expect to answer in-depth questions about your abilities and achievements). Fully prepare suitable answers to potential questions. It’s helpful to get someone to dummy run some trickier questions as well. Know that interviewers will judge you not only on the content of your answers, but also on how you convey them. Bad speech habits can reflect poorly on your performance, therefore it is important to examine your speech patterns. Recording yourself as you practice your responses to expected interview questions can be a valuable tool to improve your pitch, tone, intonation, inflection and speaking volume. Your inner tension will display itself in your voice. This may be because you are anxious and have started to breathe shallowly. Breathing exercises are excellent for anxiety management, decreasing the body’s stress response (‘fight or flight’). Look up some basic relaxation breathing exercises online. Use these to calm yourself before an interview and oxygenate your blood fully. This will mean that your brain is at peak performance. Relaxing yourself before an interview also relaxes the vocal chords. When they are tense, the sound of your voice will be higher and more raspy. Relaxed vocal chords will produce lower notes. These notes in your speech can be interpreted as more authoritative. Studies show, senior executives with a lower voice are likely to achieve higher positions of leadership. We recommend you try Breathe2Relax – a free stress management app that encourages diaphragmatic breathing exercise (the kind of breathing that has been taught for centuries as a way of turning on the body’s relaxation response). How you sit or stand does not only show your inner self visually but it also comes across in your voice. In an interview situation, you need to have a level of alertness to be mentally able to answer questions clearly and calmly but also to sound engaged with the questions being asked of you. The best way to deal with your posture is to learn to sit with your back straight and upright in the chair. A good way of doing this is to sit slightly forward on the chair so that you are not actually using the back support at all. Being a little on the edge of the chair also indicates you are ready for the action. However, be careful that it does not look too much like you want to run out of the room. You also need to keep the diaphragm as free to operate as possible. This good upright posture will give your body a chance to breathe fully. Another point to make is that crossing your legs generally limits the space for your diaphragm to operate fully. Obviously, ladies wearing skirts (or men wearing kilts!) need to take this into account in how they sit down. This is important because you can easily hear the change in the voice when someone is smiling. This is partly because you feel better and partly because of the way the facial muscles work. This also brings me to the point of doing some warm ups before an interview. Move the face around a little to exercise all those muscles packed into our faces. A good way to get you breathing well and get the blood flowing is to go on a short walk around the block beforehand. An interview can be a nerve-wracking situation – especially before a board of interviewees. Nerves can make many of us rush our answers by speaking fast. What does this mean for you, as a candidate? At a time when it is most important you appear confident and competent, if you’re speed-talking, you’re likely to be perceived as anxious instead. Furthermore, rapid speech is difficult to follow – you might give the best responses to the interview questions but your words will whizz past your interviewers like a speeding bullet. Your words will not be remembered; your anxiety will.